Today I want to review a well known jacket from The North Face. It's been around a fair while and so has plenty of feedback from many users that give a good indication of it's suitability for the trail. It's a stylish looking rain shell called The North Face Venture 2 Jacket. We've already reviewed the men's version of this jacket here on Cool Hiking Gear so I wanted to look at it's female counterpart. To see The North Face Venture 2 Jacket for men, click here. Probably more appropriate for lighter day hiking, The North Face Venture 2 Jacket is a very popular rain shell, it's been around a long time and has a lot of loyal fans. 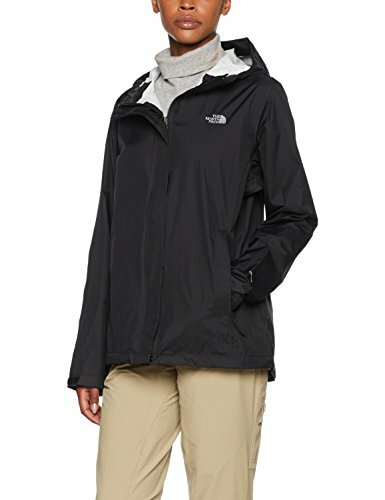 As with the Men’s version, The North Face Venture 2 Jacket for women is also a best seller in this category. Editors of Backpacker Magazine awarded the last iteration of this jacket, recognizing it for its eco-conscious construction. So, with a good history behind the Venture, I was excited to see what the new version has to offer. This jacket is made from [solid] 40D DryVent (2.5-layer), [heather] 70D DryVent (2.5-layer), [colored backer] 100% nylon ripstop. All that stuff means it has a top performing waterproof, breathable outer layer that will protect you from rain all year round. It features zippered underarm vents, aka pitzips, for maximum air flow, an attached adjustable hood with a draw cord, and a center front zip and Velcro® closure. The jacket is very packable and easily wraps up into its own pocket for easy storage. Side vents mean you can easily regulate temperature under the jacket by letting air in as and when you need if things get stuffy. The waist and hood have adjustable cords on each side so you can adjust the jacket to suit your most comfortable fit. With a center front zip and Velcro® closure, this waterproof, breathable, lightweight and sleek jacket leaves plenty of room to fit other layers of clothing underneath. The competitive price of this jacket also makes it a very popular option on the market. Of 250+ reviews, across multiple retailers, 89% gave the Venture Jacket 3 stars of more, 87% 4 stars of more and 70% full marks with 5 stars out of 5. That's very good scoring across the board! Please note, the video above is for the old Venture jacket, however, it provides a good idea of the Venture 2. Waterproof, breathable outer layer protects from rain but let’s air circulate keeping the body cool. Lightweight and loose fit leaves plenty of room for layering underneath. Pit zips give an extra ventilation option if it gets stuffy inside. Adjustable Velcro cuffs and hem-cinch cord enable easy adjustment to best body fit. Functional and good value for the price. May be a better suited jacket for milder rainy days and as a great wind-proof jacket. Some reviewers commented that for torrential downpours a more substantial jacket may be a better option. Breathability: 750-800 g/m²/24 hours average. As with the men's Venture 2 Jacket, there seems to be a fair bit of opposing opinion on the The North Face Venture 2 jacket for women. Some women swear by it while others are critical. I think this is quite possibly due to the popularity of the jacket. If it has sold many, many time to a diverse range of people for a diverse range of uses, it would make sense that it would have a very mixed bag of opinion. As with the men's version, some folks love the Venture 2 and think it's great for keeping them dry on the trail while others say it needs improving. It has pretty good customer ratings over an extended period of time and it has won awards so they are relevant factors that should be considered. I think it will be better than your average rain shell jacket and it's at a reasonable price so worth considering when making your buying decision. If you want some more options, check out the best hiking rain jackets for women. Have you used the North Face Venture 2 Jacket? What was your experience with it? We'd love to hear about it in the comments below.